How To Prepare For MTV Roadies 2019 Auditions Registration, How to Apply For MTV Roadies Real Heroes 2019, How to Become A Roadie? Roadies Real Heroes 2019 Auditions registration will shortly begin at all venues & online form available. Still many Roadies fans don't know "How to Prepare for Roadies Auditions & Registration process." 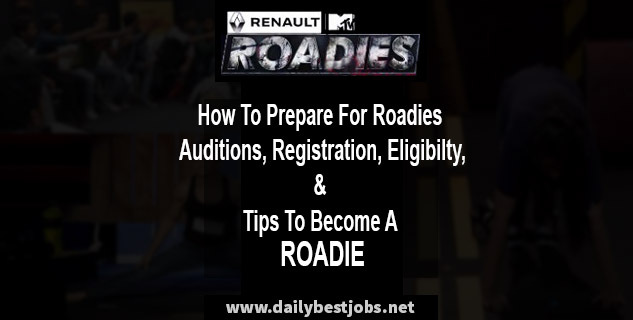 We here share with you simple steps to follow & prepare for roadies auditions and registration selection process which is most important to know before applying for MTV Roadies Auditions 2019. All roadies contestants must read these Roadies Eligibility, Selection Process, Tips to Become MTV Roadie and then prepare for roadies. Most of the youth have a dream to become a roadie and after apply for Roadies 2019 Auditions. If you have a question, How to become a Roadie contestant in new MTV Roadies season, then just need to fulfill these following steps. 1) Age: The age requires equal or above 18 years are eligible to apply in Roadies. 2) Nationality: You must be born & citizen of India to register for this show. 3) Documents: This show involves activities on a road that may be dangerous sometime, you need to have a valid driving license for two-wheelers. Also, for photo and details verification, you’ll have to show your passport before participation. 4) Personal Qualities: It is well advised to enter into this competition at your own risk because you may have to act in tasks which need a both physically & mentally strong. The Roadies Registration starts in the month of November & December. We shared here below selection criteria for Roadies Real Heroes 2019. (a) Registration: The first step is filling the Roadies Registration Form. The form is uploaded to MTV Roadies official Site. For the coming season, you have to check this website from time to time, or just stay with us to Download Roadies Form. The form also will get & filled on the spot at the venues mentioned on our site here. (b) Auditions: Next, you will have to perform at the auditions. The act for auditions may differ with this new season and judges. At last season, Harbhajan Singh became part of the judges, the auditions round was taken out in the form of Group Discussions (GD's). (c) Personal Interviews (PI's): In the last step, the judges will meet you personally & take your interview. There are thousands of participant competing in this PI round. This process may become a twist part of the selection for Roadies. Also, this round will decide whether you may go further ahead with them or not. So, we advised prior to strongly prepare for Roadies before you appear for the personal interview. Below are some following tips that may help you to get selected in Roadies and become an MTV Roadies 2019. Don't Lie: At the time of auditions, PI's, or even while filling up the registration form, make sure whatever you write in the form must fill true details. There are many contestants were not selected & throw out of this show because of false speaking. Try to write correct information and speak honestly in front of Roadies Judges. If they caught you with a lie speaking, then they will not be selecting you to become an MTV Roadie. Speak Decently: Never try to use any offensive language in front of all judges. Give answer in a respective manner whatever they ask questions in Roadies Auditions, GD or in Personal Interview. Never Show off: Don't ever try to show off more and also take care while writing your details on the form. But if you really have any special skills and confidence to show them then go for it. Be Yourself: The last important tip is to be yourself, behave cool and normal person. Never try to become over smart or special. Once they examine your all strengths or weaknesses completely with your good attitude, they will give an entry to be a Roadie. Hope, you are happy to read our post on "How To Prepare For MTV Roadies 2019 Auditions Registration." We will share more information related to Roadies 2019 and update all the details regularly. You can Subscribe your email address from here & get free updates on your mail. Share this article on Facebook, Twitter and other social sites to make aware your friends those who interesting to part and become a Roadies and do registration here. I have not passport then I can't give audition ? Yes, You’ll have to show your passport before participation in Roadies for photo and details verification. Unable to get the regestration form..can u pls hlp..?? MTV Roadies Xtreme Kolkata Audition on 20th December. The Kolkata Venue Audition details will share here soon. Stay tuned here! Try to prove & show your skills on MTV Roadies Xtreme 2017 Auditions. We will share Roadies Audition Registration form 2017-18 very soon, Keep checking here. Sir I don’t have driving licence so I m not eligible to give d audition????? Sir learning licence is valid or not?? No, A participant must hold a valid license for Roadies Auditions. I have the driving license.but i dnt have the passport..Am i eligible to participate..?? Whr is the show gonna happen this time.?? India or abroad..?? You must hold a valid driving license and passport to take participate and roadies eligibility. The journey of Roadies Xtreme will may within India or outside India, still not disclosed. The passport requires for roadies journey which may happen in Nepal or outside areas of India. Thank u for ur reply.. So if the show happens within india den der is no need of passport..Den i can give the audition...right..? Plz share Kolkata audition venue..??? Thank you for ur reply..So if the show happens within india..den no need of passport to participate..right..?? No, Every Roadies contestant must hold a passport for photo & details verification. We will share Roadies Kolkata Audition Venue details before 20th Dec 2017. Keep checking here! I have every document except passport..i just wanna give audition..plz understand..
Is Aadhar, pancard and driving license are not enough for photo n details verification.?? ?